• Following a nine-day break, the Bulls will finally return to the floor when they host Dartmouth at Alumni Arena. Both the Bulls and Big Green will be taking part in the upcoming Belfast Hall of Fame Classic next week. UB is looking for their first 4-0 start to a season since 1986-87 when Buffalo started the year with five straight wins. Wednesday night's game will mark UB's first ever home game as a nationally ranked program. • The Bulls are ranked 22nd in the latest AP Poll as they become just the third MAC program to be nationally ranked by the Associated Press since 2000 joining Kent State in 2008 and Ball State in December of 2001 where they peaked at 15th in the nation. UB is ranked 25th in the USA Today coaches poll, the first MAC program since Akron in 2012-13 when they were ranked #25. • The Bulls defeated Southern Illinois 62-53 last Monday, it was its lowest scoring output in a win since the Bulls defeated Drexel on the road 55-52 on December 29, 2013. It was just the fourth time UB has won a game when scoring under 70 points in the Nate Oats era. • UB senior CJ Massinburg moved into sixth place on UB's all-time scoring list surpassing Hall of Famer Turner Battle (2001-05) with 1,415 career points. Next on the list is Yassin Idbihi (2003-07) who finished his career with 1,514 points. • Dartmouth enters Wednesday night's game with a 3-1 record and the Big Green are averaging 93.0 points per game. Dartmouth is coming off a 100-54 win over Elms College, one of two non-Division I wins already this year for the Big Green. Dartmouth's only loss came by three points at Davidson. Following Wednesday's game, Dartmouth will play at San Francisco before joining Buffalo in Northern Ireland next week. • Five Dartmouth players are averaging double figures and six players are averaging 9.3 points or better. Andrease Jackson leads Dartmouth at 16.8 points per game, while he also grabs 7.3 rebounds per contest. Brendan Barry has 15.3 points per game and a team-high 19 assists, while Chris Knight averages 12.3 points and 8.8 rebounds per contest. Dartmouth is shooting .470 from behind the arc through four games this year. • Dartmouth was picked to finish eighth of eight teams in the preseason Ivy League poll as they received 21 points. Harvard was picked to win the league with 137 points and Penn was picked to finish second. • David McLaughlin was hired as the 28th head coach of the Big Green men's basketball program on April 25, 2016. McLaughlin came to Dartmouth after serving three years as the associate head coach and recruiting coordinator at Northeastern University, during which time the Huskies posted a combined record of 52-48. In 2014-15, he helped guide the Huskies to a 23-12 overall record and a regular season co-championship in the Colonial Athletic Association, as well as the CAA Tournament Championship to secure the school's first bid to the NCAA Tournament in 24 years. Prior to his tenure at Northeastern, McLaughlin was the head coach at Division II Stonehill College in the Northeast-10 Conference. The NABC Regional Coach of the Year in 2006 and 2011, and the NE-10 Coach of the Year in 2006 and 2010, McLaughlin is the all-time wins leader at Stonehill. For the first time in two weeks the Bulls will play in front of the home crowd as UB hosts Dartmouth on Wednesday night at Alumni Arena. It will be the first of two straight games at home, both against opponents who will travel across the pond with Buffalo for the Belfast Hall of Fame Classic. After playing three games in seven days in three different states to open the season, UB is playing its first game following a nine-day break. This will be the third all-time meeting between these schools and the first one in Buffalo since the 1927-28 season when Dartmouth won 34-31 on Dec. 20, 1927. The Big Green won the other meeting on Dec. 29, 1996 in Toledo, OH at the Toledo MVP Classic, 64-44. The Bulls are 19-38 all-time against the Ivy League with most of those games coming against Cornell. Buffalo has become the 10th different MAC program to be ranked in the national AP poll in their history. All schools have been ranked at least once, except Akron and Central Michigan, however since 2000, only Kent State and Ball State have found their way into the national rankings. The Golden Flashes were the last program to do it, as they were ranked #23 in 2008, while Ball State spent four weeks in the polls during the 2001-02 season, peaking at #15. They also spent four weeks in the polls during the 1988-89 season, including finishing the year 18th in the country. Three MAC programs have been in the Top 10 in their program's history as Bowling Green was seventh back during the 1961-62 season. Toledo, who has spent 22 weeks in the Top 25 in their history, was ninth in 1963-64, and Ohio has the highest ranking ever by a MAC school as they were fifth for two weeks in 1969-70. As for Western New York programs in the Big 4, Canisius was ranked for 11 weeks during the 1956-57 season, while Niagara has spent 20 weeks in the polls, most recently in the 1969-70 season. St. Bonaventure has had the most success in the AP Poll as they have spent 82 weeks ranked over their history, ranking as high at #2 in the country. The last time they were ranked was during the 1970-71 season nearly 48 years ago. I'm A Man, I'm 40! Senior CJ Massinburg had a career night on Friday in the win at nationally-ranked West Virgina as he scored 43 points and 14 rebounds. His 43 points are the fourth highest total by a player in the nation this year. Massinburg is only the second player to surpass the 40-point mark against a Bob Huggins coached team at West Virginia and he is the first to do it since Andrew Wiggins of Kansas had 41 points on March 8, 2014. He is just the 10th player in that time frame to have at least 14 rebounds in a game against West Virginia and the first to do it from the guard position. The career performance helps move him even closer to becoming UB's all-time leading scorer. Massinburg currently has 1,415 career points, which is sixth all-time in school history as he passed Turner Battle (2001-05) in the game at Southern Illinois. Next up on the list is Yassin Idbihi (2003-2007) who is in fifth place with 1,514 points. With a strong senior season, Massinburg could surpass the 2,000-point mark and become Buffalo's all-time leading scorer. Massinburg had 1,354 points, 542 rebounds and 214 assists through his junior season. He one of just four players nationally with at least 1,300 career points, 500 career rebounds, and 200 career assists joining Ethan Happ (Wisconsin), John Konchar (Fort Wayne), and Quinndary Weatherspoon (Mississippi State). Massinburg played in the fewest amount of games of that group at 95. The Bulls are coming off one of their best wins in school history as they defeated West Virginia on Friday night, 99-94, in overtime. It was UB's first ever road win over a team in the top 25 as the Mountaineers entered the game ranked 13th. Over the last four years, Buffalo is the only non-Big 12 team to come into Morgantown and leave with a win over West Virginia while they have been ranked in the Top 25. Dating back to 2011-12, the only other unranked non-conference opponent to go into Morgantown and leave with a win while West Virginia was ranked was LSU as they came away with a 74-73 win on Dec. 4, 2014. Also dating back to 2011-12, no opponent has scored more points against West Virginia than the 99 scored by UB. 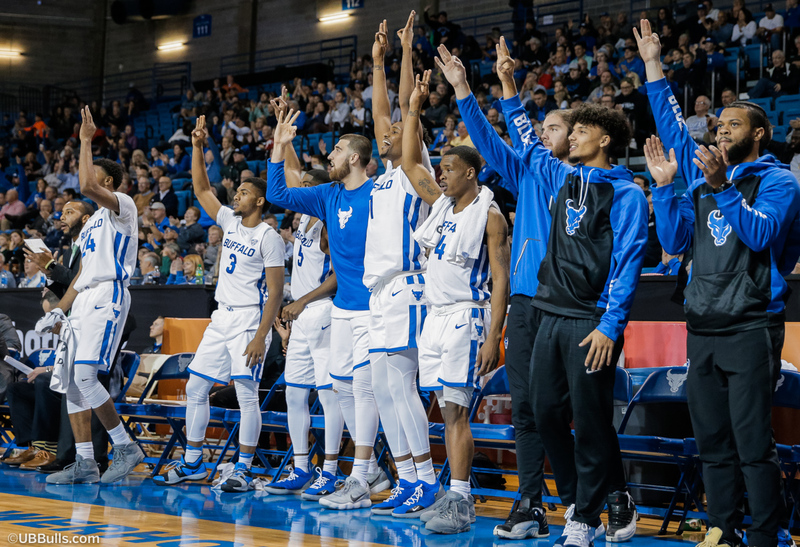 Buffalo continued right where it left off in the season opener, scoring 82 points in the win over St. Francis and 99 points against West Virginia, the 56th time in 106 games as UB head coach that a Nate Oats teams has scored 80 or more points. The Bulls are 48-8 in those games when scoring at least 80 points. Senior Nick Perkins is 14th on UB's all-time scoring list with 1,278 points, just two points shy of Rick Coleman (1987-91) for 13th place. Perkins was named first-team All-MAC last season and he was named the MAC's Sixth Man of the Year for the second straight season. Perkins scored in double figures in 25 straight games last year after returning to the bench. Over the previous two years, Perkins has scored 20 points or more nine times as a reserve, the sixth highest totally nationally. One of the most improved players in the entire Mid-American Conference last season was junior point guard Davonta Jordan. After averaging under 3.0 points per game during his freshman season, Jordan averaged 6.5 points per game last year as a sophomore, while adding 144 assists, the most on the team. Through two years, Jordan is the only player in the Mid-American Conference to record 200 career assists over his freshman and sophomore seasons. He is currently UB's active career leader in assists with 229. Jordan picked up his scoring last year, including his first career 20-point performance, which came in a win at Delaware. Defensively, Jordan was selected to the All-MAC Defensive Team as well. He continued to show his improvements in the season opener as he filled up the stat sheet with eight points, five assists, three steals, and three-blocked shots, which tied a career-high. Caruthers has been one of the best free throw shooters in the country early on this season as he has gone 12-of-12, the best total in the MAC without missing a shot. Graves is averaging 10.3 points per game through the first three contests, including scoring 14 points in the win over West Virginia, including a few monster dunks right over the Big 12 caliber foes. Senior Montell McRae averaged 3.1 points and 2.4 rebounds in his first season with the Bulls after transferring in from South Plains Junior College. McRae played in all 36 games for UB and started five contests early. This year, he has already made a huge impact for the Bulls, highlighted by his 11 points against Southern Illinois, which tied a career best amongst Division I opponents. McRae is averaging 6.0 points so far, shooting 3-of-5 from three-point range.